Rather than tracing a pear I decided to try this by tracing a Memory Box stencil. Using Colour Burst Watercolours. I used either winsor newton cotmans or Royal and Langnickle tubes however my brain is insomnia Addled so I honestly don’t remember. This is a random card I made whilst fiddling with Dies working out what I was going to do for some of the techniques. My life seems to have turned into a juggling act where I feel like I am on a bit of a treadmill always trying to catch up. 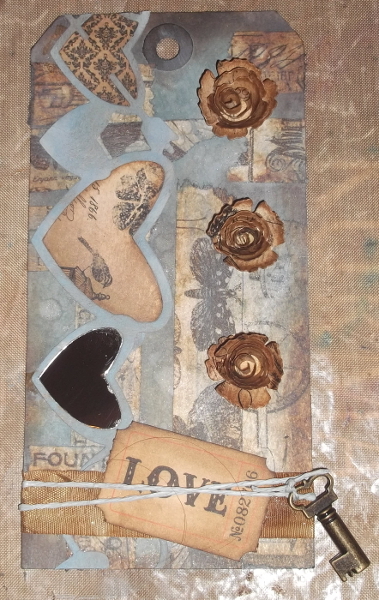 Tim’s Tag showcases 3 techniques this month, the first with Distress Paint and tissue tape, one with the new dies, and the last with the tattered pinecone rose. So I had to get really creative with it. I like to include at least 2 of techniques that we have been taught. I started with the background and used stormy Sky Distress Paint and a mix of the blue inks and ye olde vintage photo, the paint does not stand out as much as I got a bit confused and forgot to mist before I set them oh well live and learn I am still really happy with the finished product so all good. 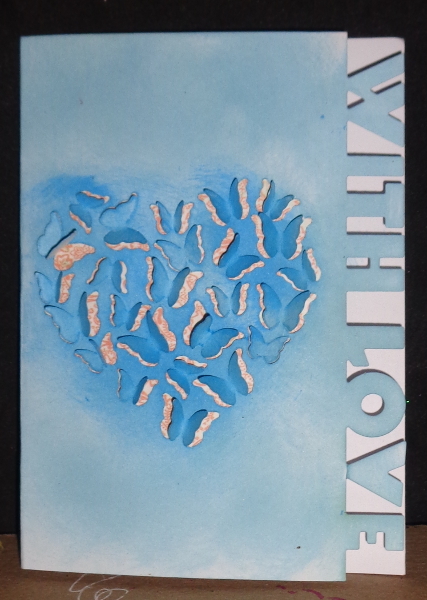 I then Die cut a Quickutz boarder die I have out of thin chipboard as well as some pattern paper and a piece of mirrored sheeting to fill in some of the hearts. I used my blending tool with vintage photo on the patter paper (which is from the Prima Pad Almanac) and misted it to tone it back down. I also painted stormy sky onto the thin chip and blended a little vintage photo over the top. I coloured some Crinkle ribbon with my blending tool and misted it, dried it and added it along the bottom with a tag, and some blue paper string. Along with an Idea o logy Key. and Viola this months Tag. Well not quite it took me quite a long time to do I really struggle with tags. I don’t know why but I find them harder than making a card or layout. So what sounds simple actually took me a good few hours to sort out and execute.